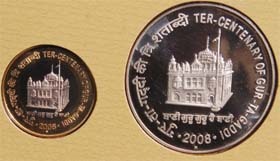 Neeraj Jain is probably the only citizen of the holy city to have received two coins minted specially to mark the tercentenary of Gurta Gaddi of Sri Guru Granth Sahib commemorative coins 2008 from India Government Mint, Mumbai. The coins are in denomination of Rs 10 and Rs 100. The set of two coins cost him Rs 1,837 for which he had applied in June 2009. The Rs 100 coin is in circular shape with 44 mm diameter and 200 serrations. It weighs 35 grams and quaternary alloy consisted 50 per cent silver, 40 per cent copper, 5 per cent nickel and the remaining is zinc. The Rs 10 coin is bimetallic with 27 mm diameter and circular shape. The out ring of 7.71 gm coin is made of aluminium bronze with 92 per cent copper, 6 per cent aluminium and 2 per cent nickel. While the centre piece contains Cupro nickel with 75 per cent copper and the remaining is nickel. The obverse side of these coins has emblem of India, ‘Satyamev Jayate’, Bharat in Hindi and India in English besides Rs 100 embossed on it. On the reverse, the coins have images of Golden Temple in relief with ‘Bani Guru Guru Hai Bani’ underneath. While tercentenary of Gur-Ta-Gaddi in English and Hindi with 2008 embossed on circular fringe of the coins. Tiny mark ‘M’ on the reverse sides of these coins indicates that these were proof coins struck at India Government Mint, Mumbai. A committed philatelic, he has been steadfastly pursuing his passion though it was leaving telling effect on his family budget. Jain has a collection of an array of stamps on subjects related to the city. 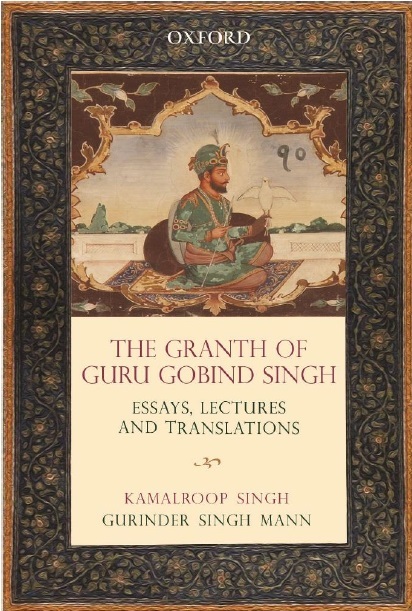 These stamps are on the Golden Temple, Maharaja Ranjit Singh, 50th anniversary of Jallianwala Bagh, Maharishi Valmiki, whose hermitage is believed to be located near the city, Bhai Vir Singh, Gurdwara Baoli Sahib, Master Tara Singh, Baba Jassa Singh Ahluwalia, Saifuddin Kitchlew, Udham Singh, 75th anniversary of Jallianwala Bagh, Nanak Singh, Gurmukh Singh Musafir, Mohammad Rafi, Bhagat Puran Singh, Partap Singh Kairon and Sam Manekshaw.